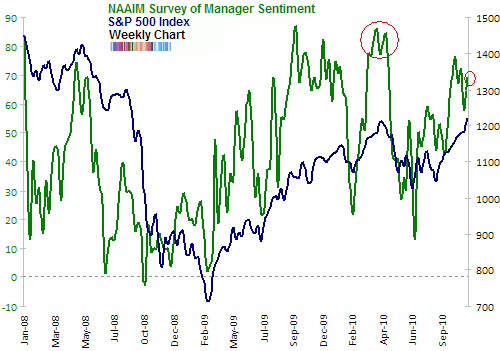 As an addendum to last week’s sentiment overview here are some other market sentiment related developments including the NAAIM survey of manager sentiment, DSI, corporate insiders, TSP sentiment, and gold sentiment. Last week’s NAAIM survey showed that active managers were on average positioning their portfolios to be 70% long the market. This is higher than 57% long in late October but it is still lower than where they were at the April top (85%). The DSI for the S&P 500 index pushed even higher last week to 94%. It is now slightly higher than the April 2010 levels and approaching a 4 year extreme. For a chart, please see previous sentiment overview. Today’s Op-Ed piece by Robert Zoellick, the president of the World Bank, got a lot of media attention. If you happened to actually read his words, instead of all the thousands of articles written about what he wrote you’d discover that he mentioned gold in passing after a list of five proposed strategies ahead of the G20 meeting. But as you can see from the chart above comparing the Gold Miners Bullish Percent index with the price of gold, at times that can be a rather short-term top. From September 2009 to December 2009 gold pushed ahead in spite of a rather high Bullish Percent index until finally succumbing to a parabolic climax. I suspect we’re setting up for yet another one of gold’s now rather predictable parabolic blow-offs. If gold follows the script of a blow-off parabolic move, as it has multiple times before, then the assets will increase even more. During the September-January 2010 period they remained “excessive” as gold continued to rally into its top. Having said that, the current level for gold definitely skews risk towards the long side. While gold may be able to push ahead with further impressive gains, a parabolic move would dictate that all that and more will be unwound within a very short time. 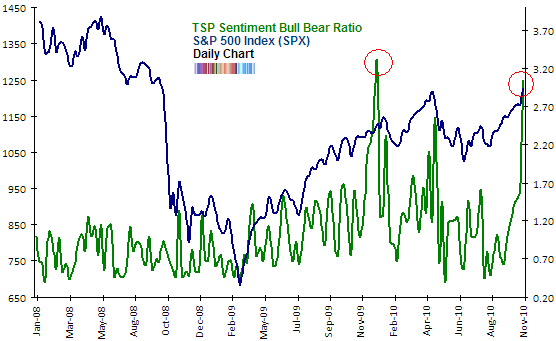 Looking at other sentiment data we also see that there isn’t a clear picture of extreme bullish sentiment, yet. MarketVane’s Bullish Consensus for gold has managed to climb to 79%. This is relatively high but not yet at an extreme level. 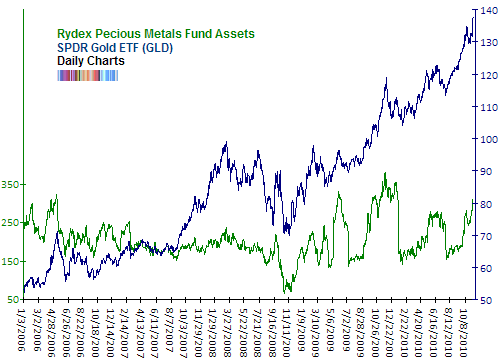 The Hulbert Gold Newsletter Sentiment index has also increased recently but to just 55%. To put that in perspective, at previous major tops it was much higher. For example, in December 2009 it reached 68%, in July 2008 it was 64% and in March 2008 it was 65%. So we still have some room to run before reaching excessive bullish levels. Finally, Central Gold Trust (GTU) has moved back into a premium (3%) from a small discount a few weeks ago. Considering the fact that gold has been lunging forward, making new highs, the premium is rather meek. To put the current figure in perspective, there were multiple days in the summer where premium went above 10%. That coincided with the top in gold prices at about $1250 (in May and June 2010). So all things considered, this level of premium is rather shockingly low. I appreciate your consistent posting of this sentiment data. It seems not all sentiment surveys are the same……. EWI, for example, has been posting the most pessimistic surveys around. Bearish bias seemed to have influenced their wave count on the latest short term market action - they mistook this recent blowout rise as wave C, not 3….. and finally corrected the mistake after it exceeded the April high. wyatt, yes, a classic and unmistakable reverse hammer candlestick. And very similar looking candle in gold. the data (chart) coming from Rydex Assets did U know if they are available online for free somewhere ?